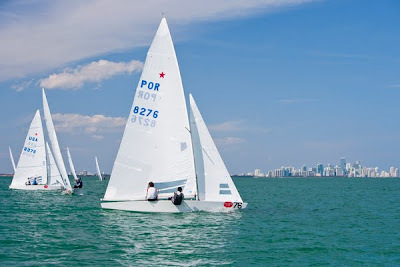 MIAMI, FL (March 9) – Light wind and a late start marked the second day of BACARDI Cup Star Class competition on Biscayne Bay with Skipper Rick Merriman and Crewmate Phil Trinter taking the overall top spot in standings with Brazilian Skipper Lars Grael and Crew Ronald Seifert securing the day's victory. In a session marked by a lot of movement and weak variable winds, the Grael-Seifert win was followed by a solid second place finish by Merriman-Trinter with Bermudan Skipper Peter Bromby and Crew Magnus Liledahl taking the third spot. Two more United States teams followed behind with Skipper Peter Wright and Crew Nathan Quist finishing fourth and Skipper Andy Horton and Crew James Lyne finishing out Tuesday's top five in the quest for the BACARDI Cup. With a second place finish today and a fourth place finish yesterday, Merriman-Trinter were able to look sharp in the overall standings leading with the most points as the BACARDI Cup continues tomorrow on through Saturday, March 13th as the class headlining BACARDI Miami Sailing Week. "The last two days have been real light and the wind shifts really haven't been that large, but they've really mattered. We found the pressure we needed and felt we had a good start to the day, which really helped along with a big gain in the second run," comments Skipper Rick Merriman. "It's been difficult out there, but luckily we've been able to stay consistent. We've really seen a lot of interesting movement because the conditions have been so light and shifty." After two days of competition, overall standings include Merriman-Trinter as the current points leader with Horton-Lyne in second place. Stout-Peters is currently in third overall with McChesney-Zwingelberg in fourth and fifth place going to Team Melleby-Mrrland.